As part of its annual Community Assistance Grants program, the Junior League of Boston awarded eight local organizations $2,500 each to support community programming. The Junior League of Boston (JL Boston), a 112-year-old women’s volunteer organization that improves the Boston-area community through effective action of trained volunteers, is excited to announce the recipients of their 2017-2018 Community Assistance Grants. Each organization received $2,500 to help them continue to serve the greater Boston community. 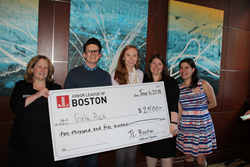 The grant recipients were chosen based on financial need, their plans for using the funds, and the compatibility of their missions with JL Boston’s focus on promoting the wellness of girls. 1. Art Resource Collaborative for Kids (ARCK) is an Arts Integration Program at Boston Public Schools. Their mission is empowering students with high-quality arts education that fosters culture and community while also supporting a school’s learning objectives. 2. Boston Centers for Youth & Families received a grant for their organized Teen Nights. Their mission is to enhance the quality of life for Boston residents by partnering with community center councils, agencies, and businesses to support neighborhood needs. 3. Boys & Girls Club of Stoneham & Wakefield received a grant in support of their Girls STEM Program. Their mission is to enable all young people, especially those who are in most need, to reach their full potential as productive, caring, responsible citizens. 4. Girls Rock received a grant for their after-school Music & Arts Program. Girls Rock Campaign Boston empowers girls to believe in themselves by providing a supportive community that fosters self-expression, confidence, and collaboration through musical education and performance. 5. Healthy Waltham was awarded a grant for their Senior Citizen Outreach Program. Healthy Waltham exists to promote healthy lifestyles and well-being for families and underserved populations in Waltham through educational and collaborative programs that engage residents in healthy cooking and gardening, physical activity and involvement in natural open space within the community. 6. More Than Words received a grant for their Life Essentials Workshops & Training. More Than Words is a nonprofit social enterprise that empowers youth who are in the foster care system, court involved, homeless, or out of school to take charge of their lives by taking charge of a business. 7. Project Hope was awarded a grant for their Adult Education Program & Speakers Bureau. Project Hope in Boston works in partnership with families so they can move up and out of poverty. 8. YW Boston received their grant to support their Girl’s Health Program. YW Boston is dedicated to eliminating racism, empowering women, and promoting peace, justice, freedom, and dignity for all. Applications for the 2018-2019 Community Assistance Grants will become available in early 2019 on http://www.jlboston.org.